Hmmm. Crystal Antlers’ latest release……what to say? We could run through the facts and go through the bio, and list off the discography to fatten the word count. It would be fitting to tip-toe around words and adjectives to avoid saying that really, there isn’t much to say. It’s a little boring, slightly flat, and it doesn’t seem to have an artistic purpose beyond it’s physical existence, although with that being said, it is hard to guage the artistic intent. Is it attempting to comment on the issues of redundancy, and lack of reason? Is it an exploration of making something for the sake of just making it? What was the point? The production sounds lack-lustre…is this intended? 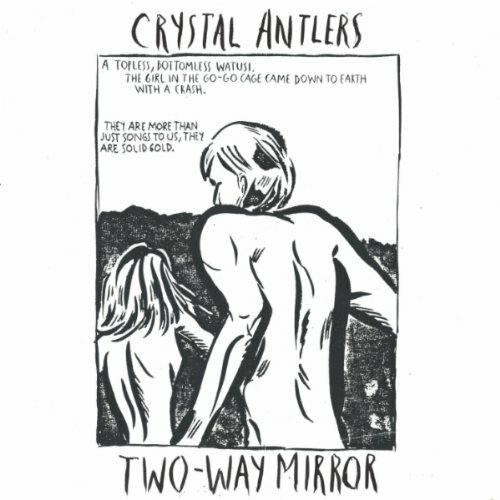 “The Two Way Mirror” does raise questions, indeed, and perhaps these are the very questions that Crystal Antlers seek to raise…but who knows? We are attending a party. It’s a party where you must do whatever it is that you do, and people are scattered about displaying their various talents or interests. Everyone is a cartoon. We are observers, just strolling around checking things out, and we come across a quintet called “Crystal Antlers.” Chances are they are off to the side of the room making quiet noise in a world of their own. They are two-dimensional pencil drawings in a room of bold colours and luscious characters. You stand around near them and watch them play while they stand in the same spot and sway around in a hazy way, looking at their shoes and jamming out to each other. They may be wearing translucent coloured sunglasses. You like it a little, but you really want them to turn it up or inflate it or colour it or do something! You can imagine it if it were bold and in colour and the textures are great, and it has some interesting timbres and soundscapes, but it is as if it’s all muffled beneath a wall of crystal. Intended?!?! Who knows?! It’s physchedelic and mellow, while meddling in rock and noise and it has great percussion and some wicked instrumental work in “Dog Days,” but upon leaving it, you are asking already on to something else and may have forgotten their name.